That Barak Obama is in good health. As noted here, Joe Biden should be kept in an undisclosed location for his own protection from exhibiting his stupidity. His statement's impact on the airline business is just what they needed right now. Joe Biden - The poorly trained labrador puppy of politics. Nita Lowey (D-FairyTale Land) has a posting on the Hill's Congress Blog that originated from the Huffington Post (at least that part makes sense) which addresses Global Warming. In it, she makes some astounding assertions. 3. Congress can mitigate the risks through legislation. While each of these is individually disputable, the best part is where the esteemed member of the House of Representatives declares that the first two have been proven. It is always amusing to listen to those who think that if Exxon funds a study it not to be believed, but if the EPA funds a study it is imminently credible. Never mind that the word has already gone out that anyone trying to disprove global warming receives absolutely no funding from the EPA. Why is that? Is it because it would be wasted money? Or is it that it would interrupt the orderly progression to taking over the economy through carbon cap and trade regulations? I would be interested to know if any of the computer models that are predicting global warming have been tested against historical data. You would think that since we know the temperatures that have existed we could plug in the data and the outcome should be exactly what it is today. Except that no computer model has ever done this. When tried apparently, they generated much warmer temperatures than what we are experiencing. Now why is that? Couldn't be a problem with the model now could it? But let's destroy our way of life just to do that. That way we will all feel better about ourselves while we freeze. "Changes in the yellow times after red light camera systems are in place and operational will affect the number of photographed violations, increasing the number of violations...," said St. John in a recent memo. While cutting one second from the yellow light may boost ticket income by 110 percent (according to a 2004 Texas Transportation Institute study), it may also increase crashes by up to 225 percent, according to the same study. Let's cut down on those people running red lights by having more accidents! Dave Budge is now posting on Electric City Weblog, (what is it with all the guest posters Greg? Taking a break?) and has a piece about Tea Parties and herding cats that is well worth the read. Dave calls for a new Jefferson or Adams to define what the purposes of the movement should be. While I am no Jefferson, I might be an Adams, simply because he was such an obnoxious sort, but I think that the first things that we need to do is to try and get a grip on what it is that the Tea Parties are protesting, and where to go from there. The interesting thing about the protests are not the numbers, which compared to other protests are not that impressive, but that the people protesting don’t usually protest. To rouse this group that is not part of the usual rent-a-mob, indicates that there is something unsettling about the direction that the country is headed that has inspired them. As I said below, there is a general consensus that the Tea Party movement is more an action against things, rather than for anything in particular. The contradictions among the various members are ignored for the moment, but this won’t last if the Tea Party is to be more than a one off. At the least, there is a certain unease with the dramatic increase in usurpation of power and authority by the federal government. The frequent questions by the Left of why now there is a protest, ignores the outrageous growth of interference by the government in all aspects of what had previously been private activities, especially in the last ninety days. And it is not limited to just being against Obama. The problems obviously started with Bush and the bank bailouts. Whether it was necessary or not won’t be determined for quite a while. I am tempted to give Paulson the benefit of the doubt for the moment that some action was necessary. However, the way he went about it, starting with a three page document and using the number of $750 billion simply because he wanted an amount that would make people take the situation seriously does not inspire confidence. Then General Motors and Chrysler came to Congress for bailouts. The reason that their requests were even listened to had more to do with the electoral counts of Michigan and Ohio than any real economic issues. While much is made of the 250,000 jobs that would be lost if GM or Chrysler were to go under, that ignores the inherent value of the plants, facilities and people that would remain after a bankruptcy. Bankrupting GM would not mean an end to domestic auto production, it would simply change the company in the same way that United Airlines was changed when it went bankrupt. In fact, the cheapest way to save the auto companies is to give the bailout money to the Pension Resolution Trust fund and separate the retirees from the manufacturer’s obligation. It would result in lower costs to the car manufacturers and constrain the growth of the retiree benefits. Instead, the government gave money to a losing proposition that only has delayed the inevitable, while at the same time giving Obama authority over the management decisions of a somewhat private company. No matter how many times I read my copy of the Constitution, I can’t figure any approach that can justify the actions that have been taken. From there, we had a $787 Billion dollar “stimulus” package, which really was nothing but a spending list that would never have been passed if Congress had exercised due diligence. In fact, there was no diligence at all, with panic being used to force the bill through both houses without debate, or for that matter even comprehension of what was in the bill. Our Congress at work! Sheesh. Many on the Left seem confused about the idea of protesting what they see as individual benefits from the actions that the government is taking. For instance, the CNN infobabe who wanted to know why the Chicago Tea Party protests ignored the $8 per week in tax cuts that the Obama administration had handed out. Never mind that they weren’t real tax cuts, but reductions in withholding, she along with the Left and most of the major media outlets ignored the latent effects of those actions. The acceleration of debt that has to be repaid by someone is not something to be ignored. Sure, Obama promised tax cuts for 95% of the population while raising it on the top earners. Of course, for about half the country, these are not tax cuts, but tax credits which are not a reduction of taxes paid, but a transfer of wealth. Even assuming you tax the top 5% at 100% of their earnings, there is not enough money there to pay for the debt that he has decided to burden the country with. Which brings me to the title of this piece. TANSTAAFL is an acronym for There Ain’t No Such Thing As A Free Lunch. Every action that the government takes, even if it is a perceived individual benefit, comes with strings. Take money from the wealthiest and transfer it to the poorest sounds noble. Unfortunately, it ignores what would have been done with the money if it hadn’t been transferred. Short of hiding money in a mattress, wealth has a worth beyond its immediate face value. What do rich people do with their money? They buy things, build things and invest it to make even more wealth. When they do any of these actions, they create demand, which creates jobs, which spreads the wealth around. Couple this with innovation and initiative and the potential for growth increases as someone makes a better, cheaper whatever. I know that this concept has been rejected as “trickle down economics” but if the separation of the differing economic classes was as total as some claimed, the poor and middle class would have been completely immune to this recession. Instead, the fact that everyone is losing money or jobs show that the economy is so intertwined that trickle down does work. But when the government takes the money, there is less wealth created. For instance, take $100 held in the possession of a wealthy person. Let’s have that person spend it on a widget. That means that there has to be a salesperson, a business and a manufacturing capability for widgets. The purchase stimulates the need for a replacement widget on the shelf for future sales keeping everyone in the system engaged in business. Take the same $100 and give it to the government. The government cannot just hand it to some deserving poor person. Instead, it has to be logged, accounted for, rules have to be made and enforced to make sure only the right person gets the money. Regulations have to be promulgated, compliance officers will have to ensure that the rules are followed, and the net result is not $100 but more like $80 (and even this might be a best case scenario). So, the difference is a $100 paycheck versus an $80 welfare check for the same amount. Everything that the government does comes with a cost. Many times, these costs are reasonable, such as the construction of the Interstate Highway system. The costs are spread about fairly and evenly through the gas tax which incurs a heavier burden on high users than it does on those whose only means of transportation is a bicycle, even if they are using the same roads paid for by cars. With every action that the government does for us or to us, it comes with a cost. Whether increased debt, or reduction in personal liberties. Think that universal health care is a great idea? Sure it is, but what happens when you get it? Do you trade the greedy corporate HMO for the parsimonious accountant from the government that determines that your life is not cost effective enough to save? Why is that better? The almost childlike belief that the government can do a better job of allocating resources has never been shown to work. But just like children waiting for Santa Claus, they know that if they truly believe, that Santa will bring them just what they want. It’s time for the adults to take control of the government. To assume responsibility needs to be more than a meaningless slogan and a call to action. Remember when John Ashcroft had the statue of Lady Justice draped with a cloth because it showed her bare (stone) breast? The hue and cry from across the land was addressed to the fanatical Christianists who had taken over the administration. Personally, I thought it was a dumb thing for Ashcroft to get involved in, but he did. The resultant media maelstorm helped to reduce his credibility even more. Now, we have an amazingly similar circumstance but because it was done at the request of "The One" I doubt that it will get the wide play like the Ashcroft kerfluffle. Not that this sort of double standard makes me angry anymore. Nope, the Left has sold their soul, and have no credibility at all. As a result, they just provide many hours of comedic entertainment. Even if they don't mean to. I left work at 5:30 and thought that I would swing by the Polson Tea Party that was scheduled from 4-6. As I neared the intersection, I saw three people holding signs supporting the Tea Party, and I was disappointed, thinking that they were all that cared. I honked and waved, and started to drive by, when I looked down on the park and saw close to 200 people there. In Polson. On a Wednesday afternoon. With the wind howling off the lake. So I parked when I found a spot and went to join in. Old, young, middle aged, and the future inheritors of our unbelievable debt were there. Rick Jore was speaking when I got there, and I have to hand it to him, that he knows his Constitutional history. His comments about what is happening to our country were very inspiring, and right in line with my own musings on the subject. I know that many on the Left are working overtime to try and lessen the significance of the Tea Parties. This is both disappointing, and predictable. The Left, (yes, I know this is a generalization, but it has enough anecdotal evidence to make some hard data) are quite pleased with themselves and their government. The Right is of course in opposition, although it could be argued that the politicians are Johnny Come Latelys to the idea of fiscal responsibility. What is interesting, and important, are the uncommitted middle. This middle is starting to realize that there is going to be a cost to the outrageous spending/borrowing/taxing binge that our "leaders" have embarked upon. So, why now, why this issue especially after George Bush ran up the debt with Medicare Part D and the TARP I bailouts and their effect on the debt? I was thinking about what the source is and I think that it started last Spring, with the stimulus rebate checks, which may have alleviated the recession somewhat, but only delayed what was coming. Combining the downturn with the unexplained jump in oil prices which triggered the housing finance crisis (a house of cards that was waiting on the puff of wind to destroy it) which was tied to the Credit Default Swaps and the economy was doomed. Then came Hank Paulson with his emergency that required the TARP funds, with no plan or idea except to throw the equivalent of the deficit at the banks. There still is no real accounting of where the money went to for those funds, and if I remember right, they haven't even spent it all. Then TARP II came along, and the 1000 page pork laden, municipal park buillding, and a mag lev train to take Harry Reid to LA "stimulus" that none of the people who voted for it had even read. Banks were sued under the aegis of community organizers to force them to loan to unqualified borrowers, and then the banks got greedy because some smart people figured out a formula that said they could never lose money. Throw in Freddie Mac and Fannie Mae, with their incestuous relationship with the Democrat Party and Bernie Madoff, and what little trust in our institutions has evaporated. The cure, according to our friends on the Left, is more of the same. Banks were regulated when they failed, so we need more regulations. Bernie Madoff was supervised by the SEC, but we need more regulations. Medicare loses approximately 15-20% to fraud, and we will solve it by creating a single payer system. And let us not forget about wealth disparity. The Left relies on the mythology that the richest people all unjustly inherited their wealth or stole it from the hard working people below them. Sure, they may find an example or two, just look at where Bill Gates jr. would be if his dad hadn't given him all of his wealth. Or all those people who worked 80-100 hours a week instead of the minimum amounts. They must have been stealing the wealth of those who only put in 40 hours a week when they were off. What the Tea Party represents more than taxes or spending, is the complete loss of faith in the institutions of this country. What the cure is, I am not sure, but I do know that the government is not going to be the source of the solution. The only thing that is going to restore trust is to remove those who have violated that trust. We need to return to shaming people when they need it. And there are a whole lot of people who need it right now. Are You Now, or Have You Ever Been . . .
reject federal authority in favor of state or local authority. So, those of us who believe in limited government, and the sovereignty of the People over the government are probably included in this number. Throw in the fact that you might be a veteran, and you rise even higher on the threat charts. Of course, the poor research by DHS means that they probably couldn't find out where we live anyway. 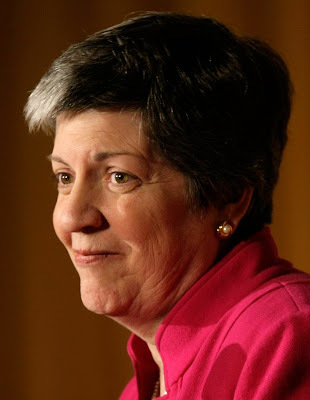 One good thing, the Obama administration has finally got up the cajones to call someone a terrorist. With less than 24 hours to the Tea Party protests, the question has to be raised, "what's next for the Tea Party movement?" In order to figure out where you are going, you have to know where you are coming from. Otherwise, you are stuck in the banality of making really good time, but that you are lost. The astounding and careless manner in which the budget is being increased should not be ignored. And that, more than anything is driving the Tea Party movement. There is also the general buyer's remorse of those who thought that Obama would bring change, which he did. Just not the change that they had anticipated. 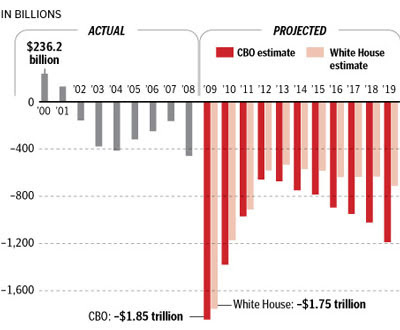 I myself was hoping that last September when Obama was complaining about the deficits that Bush had created he would do something after he was elected. I just didn't realize that his complaint was that Bush didn't go far enough. Getting back to the point of the post, the disadvantages for the Tea Party movement are multiple. First, the basis of the movement is that people are united against greater debt. Being against something has only limited utility, and can certainly collapse as more and more individuals start to feel that what the other guy is against isn't what concerns them. My suggestion would be to keep people focused on the spending side of the equation. There are plenty of useful examples out there, which make you scratch your head and ask the question "Why, if we are in an economic crisis, are we spending money on that?" When we have a "stimulus" bill that is spending money on frisbee parks, dog parks, walking paths etc., you have to wonder why we are going so deeply into debt for such items. By keeping the Tea Party movement focused on government spending at all levels, whether for bailing out automakers or banks, or any other entity, the rage that will be shown on the 15th will carry on for a lot longer than just one day.